Architectural insanity from MVRDV, our cover stars of issue #18: the Rotterdam-based architecture firm recently completed their first building in their home town, a giant covered market hall with a variety of high-end food stalls and regional farmers, in the shape of two residential buildings leaning towards each other in a giant sweep and fusing into a curved rooftop, illuminated by large murals of flowers and vegetables. 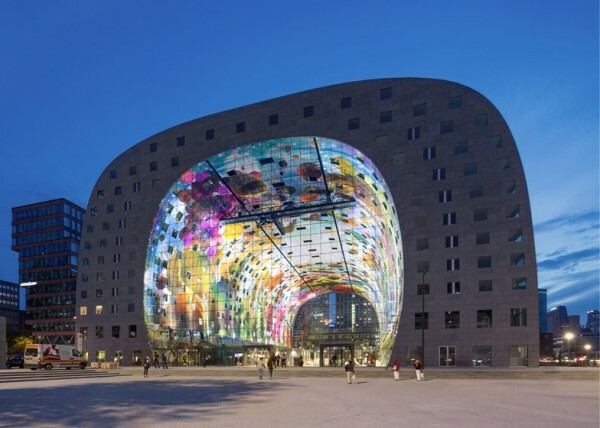 In its structural absurdity and aesthetic strangeness, it is MVRDV at their best – and, apparently, already hugely popular with Rotterdam’s residents. This was written by kvr. Posted on Saturday, November 22, 2014, at 14:13. Filed under architecture, cities, color, food, life, places, play. Bookmark the permalink. Follow comments here with the RSS feed. Post a comment or leave a trackback.